Our winters are usually characterized by 3-5 inch slushy snows which melt off in a day or two or those wintry mixes of SS&FR (snow, sleet, and freezing rain) which come about once a week. Between this it is not that unusual to have short shirt sleeve days even in the middle of January. Yet I remember hearing as a child stories told by older folks of snow so deep it was over the fences. Now that I am rapidly moving into that “older folk” category, I too can tell similar stories to my grandchildren. There was the “blizzard of March 6-7, 1962” when around three feet fell and paralyzed the Shenandoah Valley for a week. In 1966 we got a 14 incher on a Saturday, six more inches on Wednesday, and another foot the next Saturday plus a hard blow for the next two days which pretty much packed full the 5-6 foot deep trench created by the snow plows earlier in the week on the road through our farm. My dad and about four of my brothers spent a whole day with a medium sized tractor with a rear mounted blade and several grain scoops shoveling out the road so we could get a tanker truck in to pick up our overflowing milk. I still vividly remember the truck high snow banks scrubbing both sides of the truck as it squeezed through. 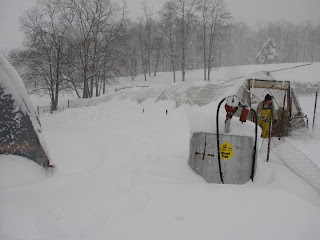 Since we have moved to Glen Eco Farm we have seen at least two 18 inch snowfalls and the most memorable 30 inches that marooned us in 1996. Christine was stranded in town for a couple of days that time and we ended up walking our recently acquired herd of about a dozen Hereford beef cows the ¾ mile down the road to the empty barn at the farm where we used to live because I couldn’t get hay to them at home. After about five years in a row in which we hardly had a snowfall worthy of a good snowball fight, the winter of 09—10 has proved it’s mettle in cold weather and heavy snow. Early December brought us a nice six inch fall. On December 18-19 the “blizzard of 09” rolled through Virginia and left two feet at our place as Christine and I floated through the Louisiana bayous and strolled the beach on the Mississippi gulf coast. We came home to knuckle whitening cold for the next two weeks and a good melt off and a three inch rain with local flooding in mid January followed by two nice snows (six inch and four inch respectively) towards the end of the month. Then it happened again! I was glad I respected the weather forecasts on Thursday February 4 as I pushed myself through the pain of Lyme disease to wrestle two large round bales up the steep snow covered hillside with my big tractor and after a lot of spinning and sliding, I finally managed to dump them into the hay feeder wagon parked along the edge of the woods on the upper side of the upper hayfield. 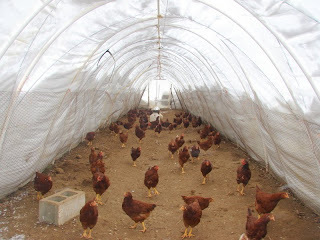 This would give the cattle more than a week’s supply of hay and nearby shelter in the woods if another big snow comes. All day Friday and Saturday it snowed—and snowed—and snowed! Boy was I ever glad I didn’t have to be out slogging around in a manurey barnyard, climbing silos, and milking cows. It was nice to have Bud Driver around to do some driveway scraping with the Ford tractor before the snow got too deep and to tend the chickens the farthest distance from the house. 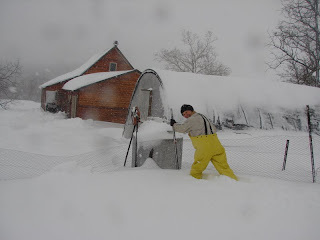 I did have to venture out to carry a few buckets of feed and water to the young chickens behind the greenhouse and to pull snow off the one standing hoop house. One of the church neighbors appeared Friday night and again on Saturday afternoon with his new Kubota 4WD tractor to open our driveway. I think he was having fun. A sensible estimate would be that we got a good two feet of new snow. Some people not too far from us claimed that we got 30 inches of course. I just know that when I walked out in it, it was up to my knees and my knees are a little higher than the average man’s. It was awfully nice to be able to slip back into the house, stomp the snow off my boots, flop into the lazy boy recliner, flick on the floor lamp, read a nice nature book written by an Amish farmer with a passion for bird watching, and to watch the falling snow through the picture window. Tonight I checked the weather forecast and another winter storm warning is up for Virginia. They are calling for up to another foot around here tomorrow and Wednesday.